I think Valentine’s Day falls into the “holidays that are way better as a child” category. In elementary school, I used to love to go the store to buy the box of Valentines for the class gift exchange. I will admit that I was a little boy crazy from the womb. I had 3 “boyfriends” alone in 1st grade. I would dig through the box of assorted Valentines and choose the “best” one for whatever boy I had a crush on at the time. But then in middle school and in high school, Valentine’s Day become more competitive. It was all about how many roses or carnations were delivered to your classroom, or what boy would slip a valentine into your locker. But now as an adult (am I really an adult? Does 25 really count? 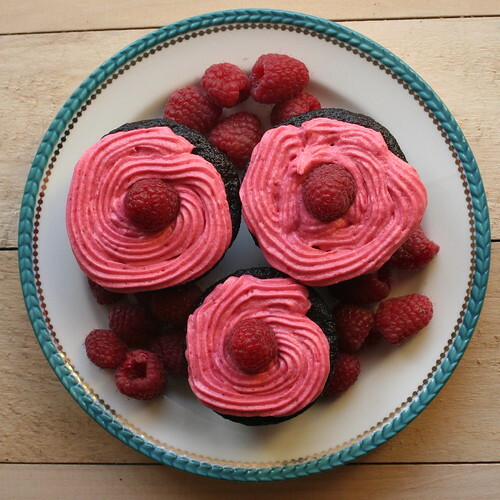 ), Valentines is just now an excuse to make some chocolate cupcakes with really pink frosting. I got pastry bags and a few tips in my stocking that I finally put to use on these cupcakes (and a little cake). The cupcakes caved a little in the centers but they still tasted delicious and it wasn’t anything that the frosting couldn’t coverup. I hope that you treat yourself, or your loved one, special this weekend. Preheat oven to 350F. Line two standard 12-cup muffin pans with paper liners. Sift together the flour, cocoa, sugar, baking soda, baking powder and salt into the bowl of an electric mixer. With the paddle attachment, mix in the eggs, yolk, milk, sour cream, oil, vanilla and warm water. Beat on low speed until smooth and combined, about 3 minutes. Divide batter evenly among the muffin cups, filling each about 2/3s full. I used a little less than 1/4 cup scoop. Bake, rotating pans halfway through, for 20-27 minutes, until a cake tester comes out clean. Mine took 23 minutes. The cake took about 40 minutes but check it after 30 minutes. Transfer to a wire rack to cool completely. Make two batches of this frosting for the cupcakes and the cake. Cream the butter in a stand mixer with the whisk attachment until light and fluffy. Slowly add 1 cup of the sugar and beat until smooth. Slowly add the raspberry puree and mix until combined. Add remaining confectioner’s sugar, 1/2 cup at a time, and beat until well incorporated. Add the vanilla extract and continue to beat at medium-high speed until light and fluffy, 2-3 minutes. The frosting can be made the night before, but do not refrigerate it. Store in an airtight container at room temperature. This entry was posted in Dessert, Holiday, Recipe, Sweet and tagged Chocolate, Cupcake, Raspberry, Valentines. Bookmark the permalink. Wow – these look awesome! I’m with you on Valentine’s Day being better in elementary school – so true! We’re mostly ignoring it over here, though I am trying to come up with a nice sweet treat to make for tomorrow night. Valentines day sounds so interesting when you were young! I never celebrated it until high school ( I don’t think I even knew about it before!) haha. I could not agree more about V-day! It is an excuse for me to eat chocolate..haha. 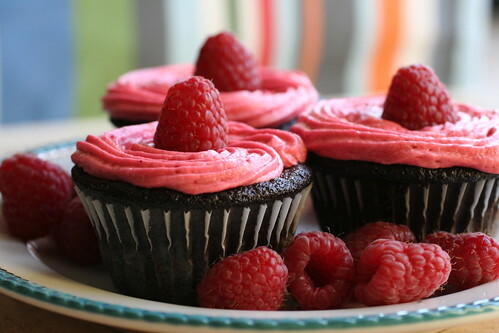 These cupcakes look fabulous! Happy Valentine’s Day! love the cupcakes with raspberry frosting… one of my favorite donuts at a great place in NYC has raspberry frosting and they are divine!!! 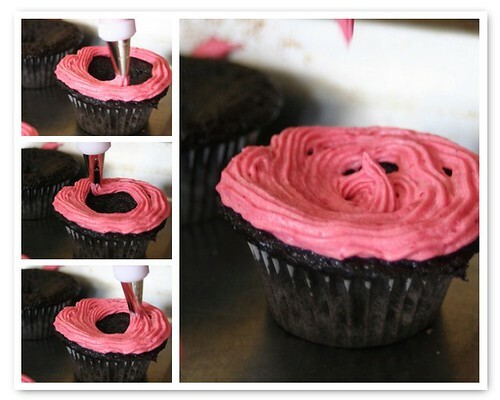 cupcakes are so much easier to make!! Your cupcakes are so beautiful. Raspberries are interesting fruits. I was looking at your first photo and saw the little hairs that stick out of these berries. They are so pretty, though. Ha love it – Valentine’s Day is definitely an excuse to eat some treats and make pink, heart shaped things – I’m all for it! 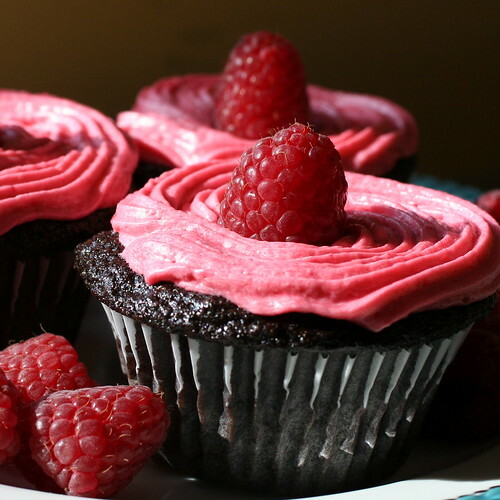 i love anything raspberry…and though v-day might be over, i sure wish i had a few of your cupcakes by my side! Just saw these cupcakes and came to your blog for the recipe. They look delish and oh so pretty. I love raspberries. Valentine’s Day is my favorite holiday and I do it up big with dinner, something sweet that I’ve baked and even little gifts for all the guests. This year I made dark chocolate cupcakes frosted with Bavarian cream and topped with a chocolate dipped fresh strawberry. They came out great! I usually do not write a comment, but after browsing a few of the comments here Maison Atlanta Blog » How do you say Glamour? We say Dorya.. I do have a couple of questions for you if it’s okay. Is it simply me or do a few of these remarks appear like they are written by brain dead individuals? And, if you are writing at other social sites, I’d like to keep up with anything new you have to post. Would you list of the complete urls of your shared sites like your Facebook page, twitter feed, or linkedin profile?